Hi, I just wanted to personally thank y'all. I received my boots today and definitely in time for my wedding! Thanks again for all your hard work, I will be sending all my family and friends your way! M and F Western Products Ladies Bent Rail Sandal in Black Sponge Rubber Foot with Black Printed Rubber Strap featuring Cushion Sponge Footbed for all day comfort. 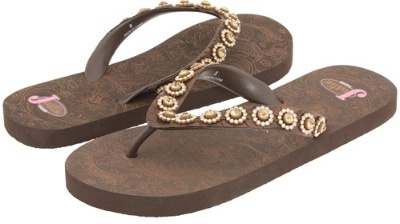 This sandal also features a Sandal Toe with Fancy Rhinestone Strap and Gypsy Printed Outsole. Whether out on the town or hitting the beach, you won't go wrong with the purchase of this fine M and F Western product. M and F Western Products Ladies Bent Rail Sandal in Black Sponge Rubber Foot with Black Printed Rubber Strap featuring a Cushion Sponge Footbed for all day comfort.